Did you know that if you don't get enough linoleic acid—a type of essential fatty acid—in your diet, you could end up with flaky, dry skin? You probably already get plenty of linoleic acid from foods like vegetable oils, nuts and seeds, soybeans, and fish. Adding in a bit of this essential and other essential fatty acids to your topical skin care regimen, however, can help reduce the appearance of aging and keep your skin looking plump, smooth, and youthful. Fortunately, rosehip seed oil—which comes from the seeds of wild rose bushes native to South America—contains more than 40 percent linoleic acid. Rose hips are actually seed pods of the rose bush, left behind after the petals fall off and full of beneficial compounds for the skin. The rosehip (of the rosaceae family) is the fruit of the rose plant, also called the dog rose, apothecary rose, and hop fruit. The round portion of the flower, just below the petals, rosehips contain the seeds in a pod that is left after the rose petals fall off. We don't often see them these days, as we tend to prune faded rose blossoms to encourage more flowers to grow. Leaving spent flowers at the end of the season, however, reveals the small, berry-sized seed pods on the tips of the stems. The native rose plant is believed to be native to Chile, where native people have used it for centuries. Rosehips have a tangy, fruity flavor, and can be used in applesauce, soups, stews, syrups, puddings, marmalades, tarts, breads, and pie, or made into jams and jellies. They are also used to make herbal tea, where they are often mixed with hibiscus flowers. Medicinally, rosehips were used in the treatment of arthritis. In fact, a study published in 2007 found that those participants with rheumatoid arthritis who took the rosehip remedy “LitoZin” improved their activity levels by 20–25 percent over those taking a placebo, with the number of joints causing pain falling by 40 percent. 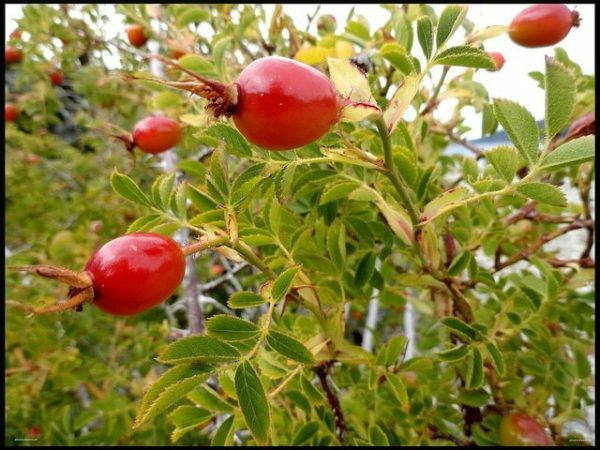 Rosehips have also been used as a diuretic, laxative, flu-like infections, diarrhea, and urinary tract disorders. Rosehip seed oil is extracted from the seeds of the native rose plant. The benefits to the skin are super exciting. Vitamin C: Rosehips are very high in vitamin C. Get enough vitamin C on your skin, and you help preserve a firm and tight appearance. Of course, it's a powerful antioxidant, protecting from environmental stressors, which cause skin dryness, fine lines, and wrinkles. Vitamin A: Rosehip seed oil is also high in vitamin A, which is a key anti-aging ingredient. Another powerful antioxidant, it promotes firmer, smoother skin. Vitamin E: Vitamin E is often added to rosehip seed oil to help preserve it in skin care formulations, and vitamin E is also another powerful antioxidant that protects It also helps to moisturize. Essential fatty acids: Essential fatty acids help your skin look healthy and plump. If you want a natural product that provides visible anti-aging results, you need something with rosehip seed oil. Try these, and let me know what you think! Have you noticed a difference after using these products? Do you use rosehips for other benefits? Photo courtesy gustav1911 via Flickr.com. “Rose-hip ‘remedy' for arthritis,” BBC News, June 18, 2007, http://news.bbc.co.uk/2/hi/health/6763017.stm. While the Rose Hip fruit itself is very rich in Vitamin C, the extracted oil itself does not contain any amounts of Vitamin C as it is a water soluble vitamin.